Just when I start to feel like there are fewer and fewer kindnesses in the world, I encounter a truly nice person. Back in August of last year, I mailed an autograph request to a certain member of the Baltimore Ravens. He was my mother-in-law's favorite player, and I thought an autographed photo would make a nice Christmas gift. Christmas came and went; my mailbox remained photo-free. Obviously this Raven is not the nice person in question. Sometime in January, a Facebook friend who is a local sports authority mentioned having autographed photos of this particular Raven to give away. I took the opportunity to complain about my situation. Another friend of his, non-mutual, commented that he had several autographs of said player and would be happy to give one to me for my MIL. Wow! Was I ever pleasantly surprised! I happily accepted his offer and picked up the photo at his family business - Pastore's. While there, we also picked up some dinner. I was in the mood for an Italian cold cut sub and ordered half of their "gonzo," so-called because it's made with an entire loaf of Italian bread. Indeed, the sandwich is quite large, so I was glad to have ordered only half (which still made for a couple of meals). 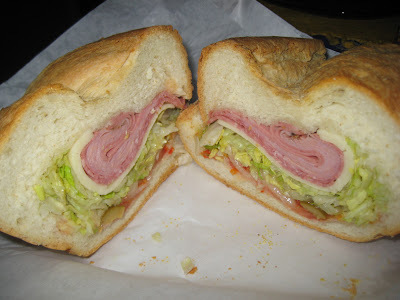 I enjoyed the combination of mildly spiced cold cuts, including my favorite mortadella, with a judicious topping of shredded lettuce and tomato, oil and vinegar, hots, and olives. The flavors melded well together, and even the next day, the bread stayed fairly crisp. Mr Minx tried a hot sandwich. 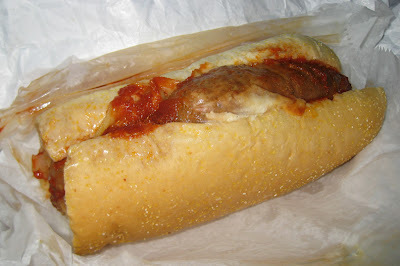 The Italian sausage Parmesan sandwich came on a more managably-sized roll. The sausage was extremely tender, like a meatball, and there was just enough sauce to moisten the sandwich but not make it soggy.